This post is specially dedicated to Winnie who asked our mummy for advice on how to keep us clean daily. We have a cleaning up session daily after our dinner. This session is very important as it keep us neat and clean till our bathing day. This slide show you what has been done, hope is helpful to you. If your dog's face and eye area already has staining, it will take times to clear off. You have to be very persistent and make sure the face area is cleaned daily and try to keep it dry. This is how I maintenance my dogs and we been doing it for years. Years ago, some of them also have staining on the face but after I started cleaning them this way persistantly and daily, it help to clear away the stain gradually. However, your's is still a puppy, so don't worry as during their teething time, they tend to have tearings. Once this is over, the condition will improve. Hope the above is helpful to you. I'm not really an expert, this may work on my dogs but not yours. However, it's good to have a daily grooming session with them as it trained them to be more discipline and also for bonding too. My dogs always look forward to their daily grooming session as this is the only time we give them our full attention. Happy grooming! Thanks for the advice, btw, may i know what is Johnson's Pure Cornstarch Powder use for? Billion thankssss to Wen for the useful and helpful info about ur dog daily grooming. I've gain a lot of knowledges that is so important to me especially my 7mths old puppy who looks so messy all the while especially around his eyes till his mouth. 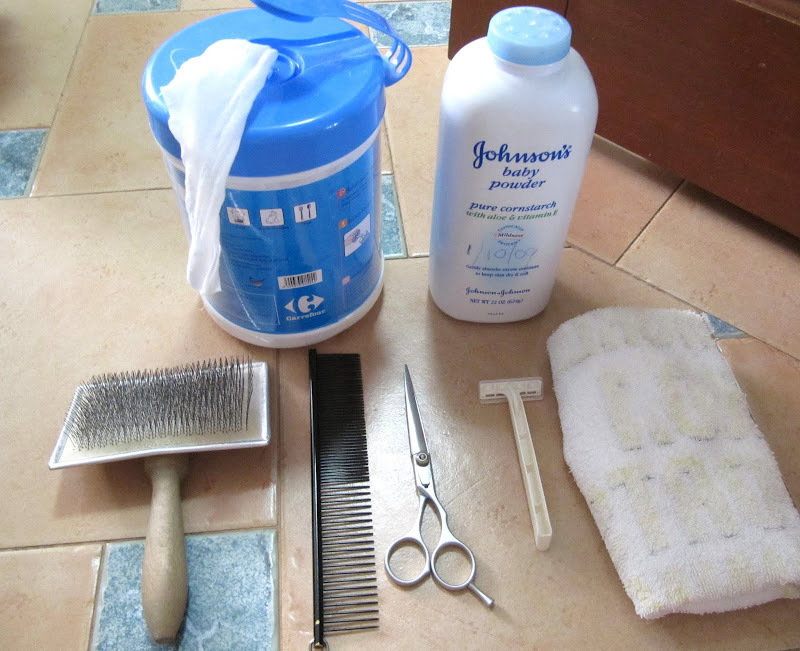 im gonna start to groom the way u taught me and hope to say bye bye to the stain! yeah!!!!! Sorry to disturb you again. Just wanted to ask u, wat is ur daily meal given to ur dog? as for mine, i just feed him dog food brand "ANF" every meal, but he seems doesnt like to eat and he will take sometime to finish it, sometime even eat once a day which is during end of the day when he feels hungry only. From wat i read through ur blog, u had made a lot of food for ur dog by ur own. but i dun have the time to do all this and i feel tat my dog is still young maybe the food might not suitable for him. Pls help! thanksssss a lot!! It's a type of baby powder with cornstarch added. A very fine texture powder that absorb odour and moisture very well. Especially useful on our darling's face and beard area. I like Johnson & Johnson brand as it has a nice fragrant but is not available in Singapore. Usually I will get my brother to buy from oversea like States and Australia for me. If you are interested, maybe Mustafa has. Last time I used to get it from there. Or you can get another brand - Pureen which is available in most department stall under the baby section. You are welcome! Hope your doggy tear stain will go away soon and hope my method works on yours too! My dogs daily food are also dry kibbles. The brand I'm feeding is Wellness - Whitefish & Sweet Potatoe. I choose fish because 2 of my dogs are allergy to chicken. Those homemade food are mostly feed as snack and treat or on occasion like their birthdays. For their daily meal will be wellness dog kibbles mix with some cooked carrot and cod fish. Refer to my blog for details. Usually my aunt will cook a large portion that last almost 3 weeks. Then she will pack into daily portion and freeze it. Feeding time is also very important. Always feed your dog at an appointed time. Give him an allowance of 1/2 hour to finish his meal. If he don't finish his food, remove it. Don't let him take his time. You must let him know that if he don't eat now, he won't have anymore food later. Don't feed him any treat if he don't eat his daily meal. As I have 6 dogs so I have to be very routine. I can't just leave the dry kibbles there for them as the greedy one will definitely finish up. Again thanks for ur sharing. Just wondering where can i get wellness brand dog kibbles since i came from m'sia. :( my i know how much it's cost? if possible i can ask my sis who staying at spore to buy for me. I dont made homecooked for my dog, do u think is it possible to feed my dog some dog kibbles mix with rice? However, you don't have to feed this brand if you can't find it in Malaysia. There are many premium brand of dogfood in the market. Choose one that has no corn and by-product. Eg like Solid Gold, Canidae, Nature Variety, Timberwolf etcs All these brands that I had listed, all my dogs ate before and worked well for them too. Don't mix dogfood with rice, rice has no protein only carbohydrates. Dog is carnivore, they don't need so much carbo, their diet should be high protein instead. Especially Young dog is more active they need high protein food. Sometimes, when I don't have anything for them, I will add 1tbsp of milk (eg HL milk) to their dry food for them. My dogs love it maybe you can try but note that some dogs cannot tolerate lactose. So you can try using lactose free milk where you can find in pet shop or supermarket. Remember you have to be persistent in order to train your dog to have a good eating habit. Dog is very smart, they know that if they don't eat their owner will try to give them some other food. Example, like my dogs, before my aunt came to stay with us, I don't give them so many varieties of fruits except apple. With my aunt around, she really love them very much. She will buy blueberries, strawberries, kiwi, pear, papaya sometimes even durian for them. After having all these, now they no longer interested in apple. When they saw me eating apple, they don't even come near. Is the dog kibbles selling at the website that u given to me cheaper compare to others shop? And may i know what supplement that u given to ur puppy? I'm not very sure maybe comparable. Usually I ordered the biggest pack and need them to deliver. So it sort of convenience to just order online. Shih Tzu's coat colour will fade as they age especially if you always trim down the coat. For those long coated ST, their coat colour still maintain because they never clip the coat at all since birth, probably just trim the ends. Of course feeding a good dog food also will help. As for mine, I never feed them any supplement at all as I'm already feeding them a premium dog food and furthermore they are in short coat. Last time when some of them were in long coat, I did feed them these 2 skin supplement. With passion, everything can be done. I'm not super woman just thank God I have a Aunt staying with us. She love and precious them like little kids. She likes my doggies super nanny. She help a lots in taking care of them. Learned a lot from you in just one sitting, Wen. I have a 2 year old Shih Tzu and she has been having stomach problems periodically since we've had her at 3 months old. At this point, after about every 3 months, she will just not eat, her BM will get lose and sometimes she will vomit in the morning. She is negative for any parasites or worms, but she is otherwise healthy and active. We put her on Wellness Simple Solutions Salmon and Rice formula, mixing both the dry and the canned version. I've been trying to slowly decrease the wet and increasing the dry and whenever I get close to just giving her the dry by itself, then she would have the stomach problem bit. Have you heard of this before?? Haha, I'm really not an expert just very blessed and lucky to have 6 very adorable shih tzus that are very healthy and happy eater. I'm not sure whether is it stomach problem, I think most probably is gastric problem. This is quite common to 2 of my dogs who are very picky on food. Sometimes if they refuse to eat and miss the meal time, they will vomit too. The vomits are usually quite stinky and yellowish in colour. So to prevent this, must always make sure to feed them on a fix time of the day. Try not to always change their food, will make them will picky as they tend to expect somethings different everyday. Recently Wonder also has this problem as she always refuse to eat due to depression and been vomitting a lot. So we sent her to the vet, she was given a jab and some appetiser booster pills. After all the medication, she is back to normal again. We just adopted a shih tzu who was terribly abused. She lost her right eye due to a neglected infection. Can you believe anyone could be so cruel? She is adorable, and a joy!